Unless Nepal is able to create significant number of jobs in agriculture, infrastructure and tourism labor migration to other countries won’t stop. A popular Nepali song by Hemanta Rana says, “Sun saili saili pardesh baat ma aula, chalis katesi ramaula”, which roughly translates to “Dear beloved, I will return from abroad and will have fun after turning 40”. 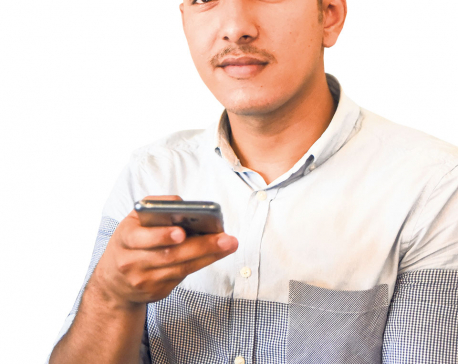 Millions of Nepali youths like Gaurav Pahari (who plays the protagonist in the music video) are leaving behind their beloved children and family to earn a living abroad, and with a dream of making their life comfortable after 40. According to the Department of Labor, over two million Nepali youths are working abroad, mainly in the Gulf countries and Malaysia. This doesn’t include millions of others who work in Nepal’s southern neighbor, India. Remittance—the money sent home by migrant workers—contributes nearly 30 percent to the country’s Gross Domestic Product (GDP). Emerging from the decade-long armed insurrection and acute political instability, remittance has emerged as one of the main sources of income that is sustaining the country’s economy. But the recent diplomatic crisis in Qatar, which hosts over 400,000 Nepali workers, shows that too much dependence on remittance could bode ill for the country’s economy. As Qatar’s neighbors including Saudi Arabia attempt to isolate the gas-rich country, the number of Nepalis leaving for Qatar has declined sharply, according to official statistics. With 20 governments in as many years, Nepali leadership has done little to create employment opportunities back home or to provide skills to over 1,500 youths who leave the country every day in search of work. Moreover, little attention has been paid to the huge social costs the Nepali society is incurring by sending its young people abroad. Studies suggest that foreign migration is abetting internal migration in Nepal as returnee migrants want to move their families to district headquarters or town centers. There is shortage of agricultural laborers and Tarai districts now largely depend on workers from India to plant and harvest crops. While households are marked by lonely elders it has also overburdened women to shoulder both household and community activities. In the song “Sun saili…” when the protagonist tells his wife she is in his memory all the time, she can’t respond, and instead bursts into tears. Millions of Nepali women are facing a similar plight thanks to migration. The social cost of migration, thus, has been quite considerable as children can’t spend time with their dads, parents don’t find the company of their sons and daughters and wives miss their husbands very much. Nepal has witnessed a sharp decline in fertility rate over past last two decades. Total fertility rate (defined as the number of children who would be born per woman) stood at 5.1 in 1991, which declined to 2.6 in 2011, according to the Central Bureau of Statistics. Such a sharp decline has been attributed to factors such as expansion of education, access to contraceptives and more importantly, huge number of male migration. 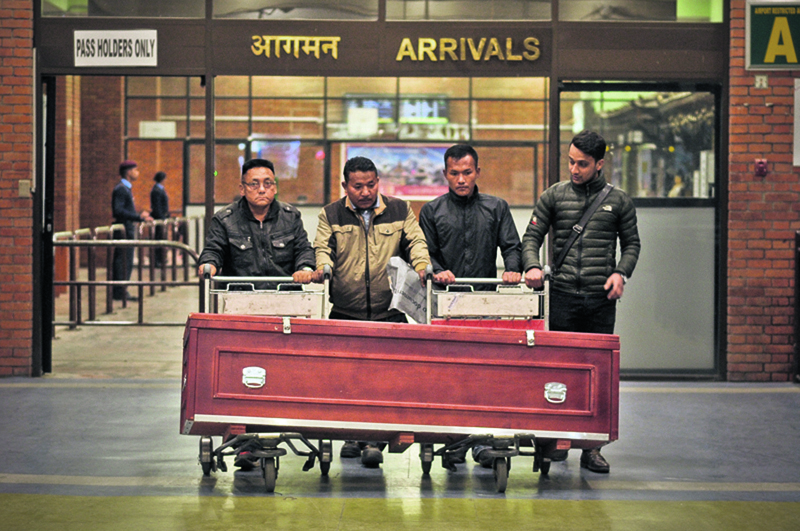 While on average one or two coffins land at the Tribhuvan International Airport in Kathmandu every day carrying bodies of Nepali migrant workers who die—mostly of sudden cardiac arrest—in a foreign land, reports suggest that nearly 10 percent deaths of Nepali migrants are due to suicides. This is yet another example of the costs associated with the migrant economy. The World Bank study declared that a systematic assault is needed for Nepal to break the vicious cycle and create the right balance between job creation at home and exports of labor. With the first phase of the local level election taking place after nearly 20 years, a sort of enthusiasm can be seen across the country. But uncertainty facing the second phase and row over the constitution still pose challenges in the short term. In the long term, the challenge would be to find adequate capital and skilled manpower to build infrastructure and create employment opportunities. Unless Nepal is able to create significant number of jobs especially in agriculture, infrastructure and tourism sectors, huge population will continue to migrate out of the country. Unfortunately, burdened with debt and growing uncertainty in their work destinations, they may not be able to realize their dream of having fun after they turn 40.